In Delibr you write specifications as free-flowing text in a bullet structure, starting from a blank document (or use this template). By adding indentation, you can create sections. But you can also enrich the structure by setting the type of the bullets to questions, and when relevant, also add alternative options, and pros/cons. We encourage spec writing in the form of questions as we believe a good specification can be simplified to a list of questions and decisions. You can then either make a decision on your own or should a question not be ready to be decided upon, leave it open and involve the team. A key benefit of Delibr is the built-in problem-solving feature that helps to structure any discussion and let you make a decision based on what your teammates actually think. Once a question has been raised and received options and arguments they can be rated. It is a huge help when working towards a decision to be able to see which arguments are highly valued by who. If someone in the team doesn’t like an option that the rest of the team prefers, that person can then add a con argument to clarify its view. Once a decision is made, it is documented with full traceability. In Delibr you can see at a glance what has been decided and also what questions are open. If your team is working in an agile environment, so should your feature spec. In Delibr you can add new questions at any time, even during implementation. You can also poke decisions that already have been made. Poking a decision puts it back up on the table, and notifies relevant stakeholders that the discussion might need to be reiterated. 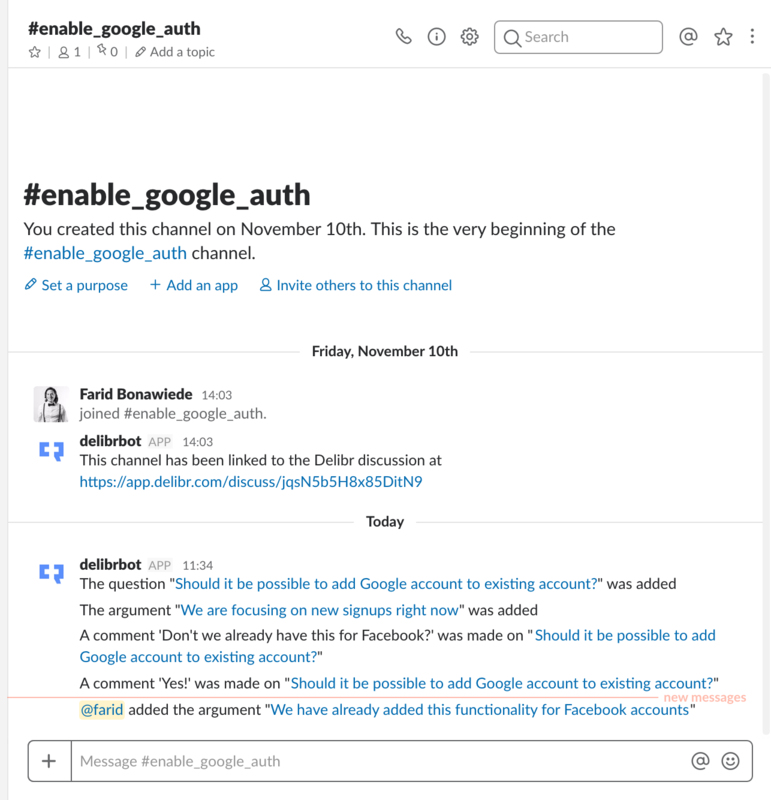 With Slack integration Delibr makes sure that everyone is informed if new questions are added, further decisions are made or if a decision is poked. People no longer involved can keep an eye on how the spec evolves and engage in the spec when necessary.